September 4, 2015 – The Laboratory for Atmospheric and Space Physics (LASP) in Boulder reports that the MAVEN spacecraft is in the midst of its latest deep-dip campaign. 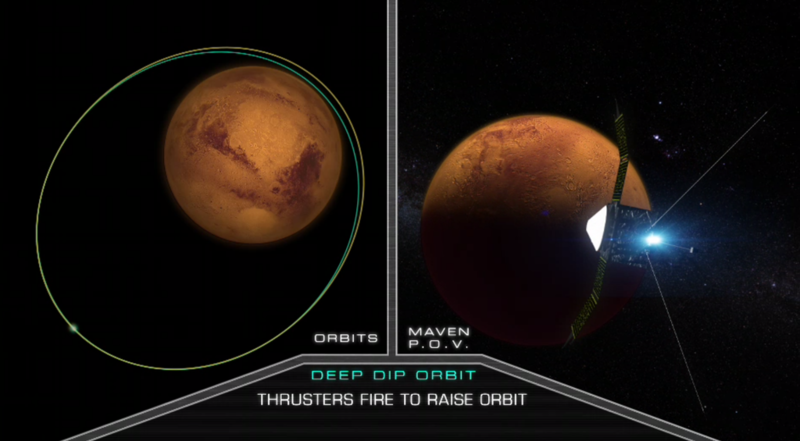 This is the fourth of five planned deep-dip campaigns for the mission. Two maneuvers executed this week placed the ‪MAVEN‬ spacecraft into a deep-dip corridor, with a periapsis altitude of 121.2 km (75.3 mi), where ‪‎Mars‬’ atmospheric density is 2.2 kg/km³. At a periapsis latitude of 65.7ºS, this deep-dip campaign will provide coverage of Mars’ south polar region. During normal science mapping, MAVEN makes measurements between an altitude of 150 km and 6,200 km above the surface. During deep dip campaigns, the spacecraft’s lowest altitude in orbit (periapsis) is lowered to approximately 125 km to provide data from the boundary where Mars’ upper and lower atmospheres meet – also referred to as the “homopause.” The altitude difference may not seem like much, but it allows scientists to make measurements in an area where atmospheric densities are more than ten times what they are at 150 km above the planet’s surface. Each of the five deep-dip campaigns last for five days. The first three days of the campaign are used to lower the periapsis, by gently firing the rocket motors to “walk” the spacecraft to its lower orbit. The remaining two days allow the spacecraft to collect data for roughly 20 orbits. Since the planet rotates under the spacecraft, the 20 orbits allow sampling of different longitudes spaced around the planet, providing close to global coverage. At the end of the campaign, two maneuvers are conducted to return MAVEN to normal science operation altitudes.